During the summer months, wildlife is ever-present in my garden – bees buzzing, birds chattering, the odd frog hopping away as I move a pile of plant pots – but come autumn and winter, most of them just sort of...disappear. Right? Well, maybe. If there is nowhere for insects, birds and mammals to shelter or to feed when the weather is cold, then the chances are that not many will stick around to see if conditions improve again in spring. The way I see it, if I ensure that the wildlife that shares my garden is well catered for in winter, they will stay to enjoy my hospitality and repay me next year with free pest control and pollination services. There is a very simple way to ensure that wildlife has somewhere to hunker down and wait out the harshest weather, and that's to refrain from tidying up. Some people may be horrified at the idea, but the truth is that hacking back every stem and scrap of foliage when your herbaceous plants start to look a little dowdy turns your garden into a pretty hostile environment for wildlife to try to survive in. While you can make or buy dedicated insect hotels, any hollow standing plant stem will provide a great winter retreat for insects. Ladybugs, lacewings and wasps will contentedly wait out the winter under any loose bark on logs, and piles of stones, twigs and other prunings make inviting habitats for any number of creatures. You may not want to display twig or stone piles right in the centre of your garden, but tucking them away behind shrubs or a shed, out of sight and undisturbed, makes for a perfect insect-friendly hideaway. It is possible to make a feature of deadwood though – pile old stumps, logs and twigs under deciduous trees and plant it up with winter flowering bulbs, primroses, ferns, pulmonaria, hostas and other woodland plants to create a characterful garden bed. Deciduous trees and hedges provide shelter but at the same time let light filter through, which enables perennials and winter bulbs to be grown beneath them. They also provide valuable fallen leaves – rake them into a pile, or leave them lying as an insulating blanket on borders, and you might even find yourself playing host to a frog or two. Frogs are important predators of slugs, and they like to overwinter in warm compost bins too, so take care if you feel you need to turn your compost. As well as a safe place to overwinter, all creatures need to eat – even hibernating animals may wake occasionally and need a quick calorific boost to ensure their survival. Make sure to include winter-flowering plants in your garden – snowdrops, winter aconites, witch hazel and forsythia will all provide essential nectar. Evergreens such as pyracantha, cotoneaster and ivy produce berries that birds will turn to in late autumn and winter, and they will love to forage for insects amongst the dense foliage. Delay shrub and hedge pruning if it will remove seeds or fruit that will feed birds and small mammals. 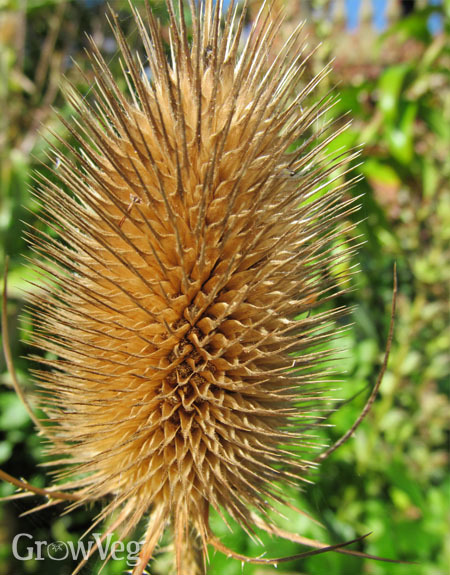 Seedheads on plants such as alliums, honesty, teasel and sunflowers should be left standing to provide essential winter food for finches and sparrows (plus they look stunning when sparkling with frost). If you grow fruit trees, don't feel you need to pick up all the windfalls if you have no use for them – blackbirds and thrushes will be grateful for these. You can always throw rotting fruit to the back of the border if you want to get it out of sight. Water is an essential but often forgotten element of a wildlife-friendly garden – if there are no ponds nearby, consider installing one. Make sure that there is a shallow end – for instance, pile stones up to the edge to enable wildlife to climb out should they fall in while having a drink. Even small gardens can squeeze in a micro-pond in an old tin bath or half barrel. If your pond freezes over for a long period in winter, this can suffocate the wildlife beneath the surface, so melt a hole in the ice by gently placing a pan of hot water on it. The well-managed vegetable garden may not be the tidiest one in town, but you can be sure that the local wildlife will think it's the very finest! When springtime comes around and it's finally time to have a clear up before new growth starts, having predators on hand to control pests such as slugs and aphids right from the start ensures that nature is kept in balance. "This was fantastic. Thank you!" "an excellent article, I have a pond and an area for insects to hibernate on my allotment "
"Great post! It's great to attract wildlife to your property since you can only benefit from that. You need to provide shelter, food and water and welcome wild animals to your garden. Your article offers a lot of information and tips! Here's another rather shorter post with tips: http://tinyurl.com/m2e5abe"
"Very good blog post.Really thank you! Fantastic. " "Ah! Thanks. Haven’t had time to clean up my garden. I feel much less guilty now about my non orderly garden space knowing that there may be wonderful habitats there for our little friends. "